ABOUT HONOR YOURSELF REVIEWS TABLE OF CONTENTS READ EXCERPTS READING GROUP GUIDE BUY THE BOOK IN THE U.S.
A NATIONAL INDIE EXCELLENCE AWARD WINNER! We all know it’s important to give back to ourselves. So why is it so hard to do it? We’ve grown up with myths—half-truths—that prevent us from living a life filled with possibility and passion. 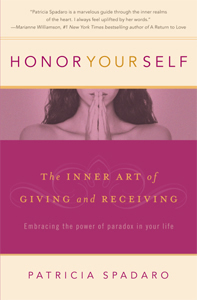 Honor Yourself: The Inner Art of Giving and Receiving by Patricia Spadaro exposes the most potent myths about giving and receiving that can sabotage your relationships, finances, career, even your health—without you knowing it. With candor, compassion, and a bit of humor too, Patricia Spadaro shares empowering ways to move beyond those myths to the magic of balanced, authentic living. Her work combines wisdom from around the world with real-life stories and practical tools to create an inspiring guide to honoring yourself so you can give your greatest gifts to your loved ones, your communities, and the world. Learn practical ways to master the delicate dance of giving and receiving—and unleash the full power of your creative spirit. Honor Yourself skillfully guides us through one of the key paradoxes—and stressors—of our time: how to balance what others need with what we need, how to give and to receive. Should I sacrifice for others or give to myself? Be generous or draw boundaries? Stay in a relationship or say goodbye? Tensions like these are not only a natural part of life—they are life. While modern society is ill-equipped to bring us back into balance, the sages of East and West are experts, and Honor Yourself explores their practical, and surprising, advice. honoring endings, and much more. Just as importantly, Honor Yourself will teach you the steps for staying in balance. For when you learn the steps, you can perform the dance—and that’s when the magic begins. Available nationwide at your favorite neighborhood or online bookseller. 5 1/4 in. x 8 in. Also available as an e-book. Booksellers, please contact SCB Distributors or order through any major wholesaler. this your best year yet. “Honoring yourself is not about pampering yourself. And it’s not about turning your back on those who need you. The issues surrounding giving and receiving are deeper. Much deeper. By honoring yourself, you are respecting, appreciating, and giving birth to your best self so you can give creatively—and abundantly—in ways that honor others." Create your own "Honor Yourself" book club to discuss Honor Yourself: The Inner Art of Giving and Receiving, bring it to your existing reading group, or use it as a springboard for self-discovery. Copyright © 2004-. Patricia R. Spadaro. All Rights Reserved.